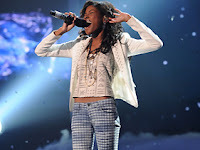 WJSG Internet Radio: 'X Factor' Results: Who Made The Final Four? 'X Factor' Results: Who Made The Final Four? Luck was not with the ladies on Thursday night's (December 5) "X Factor"results episode, with an all-female bottom three and Diamond White and CeCe Frey eventually heading home. The third bottom-dwellers, Fifth Harmony, kept their girl power going when they sang for their lives against White with Mariah Carey's "Anytime You Need a Friend," leaning on each other for the powerful-but-vulnerable slow jam. White, meanwhile, channeled fellow contestant Tate Stevens by going country with LeAnn Womack's "I Hope You Dance." In the end, only White's coach, Britney Spears, opted for her to stay, with Simon Cowell, Demi Lovato and L.A. Reid all voting to keep Fifth Harmony around. "I'm just thinking of Cher Lloyd," White said, maintaining her trademark smile. "She finished fifth on her season, and look where she is." Spears had these words of encouragement for her mentee: "The world is yours." Frey might have survived longer than viewers expected, but her time ran out Thursday, when Lovato's final team member was the first person sent home as the week's lowest vote-getter. "I'm very proud of everything I've done on this show," Frey said. "I'm ready to leave it with this platform I've been given. ... I hope I taught everybody at home that you need to love who you are." Demi rocked leopard-print face paint in honor of her final contestant and shed tears when her name was called. "I've grown really close to you, and I'm just so proud of you," Lovato said as she hugged Frey. "I've grown so close to everybody behind me," Frey said of her fellow singers. "I love you guys, and this has been an incredible experience. I'm so grateful." Frey can take comfort in the success of the night's featured performer, Ke$ha, who also has an affinity for animal prints, bleach-blond hair and glitter. The party-girl pop star brought an animal-masked squad of male dancers to back her up on new single "C'Mon," from the just-releasedWarrior album. Reigning "X Factor" champ Melanie Amaro also hit the stage to perform her latest single, "Long Distance." The intro package included Amaro's path from her audition as an unknown all the way to the confetti falling on her last year. She made a triumphant return to the stage, thanking the panel and saying "it feels great" to be back.